Currently, only Muslims can go inside the Dome of the Rock, and you have to get lucky to get up onto the Temple Mount at all. Fortunately, heaven smiled down on us and we were able to make the ascent. 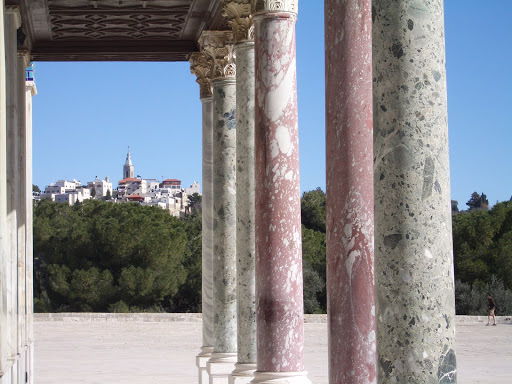 The view from the Temple Mount is amazing. You can see almost all of Jerusalem. 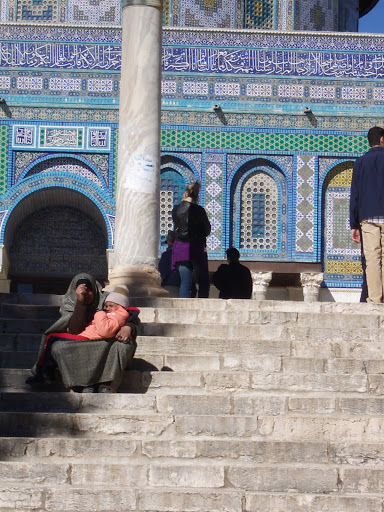 A woman begging on the stairs to the Mosque. There are beggars everywhere in this city. 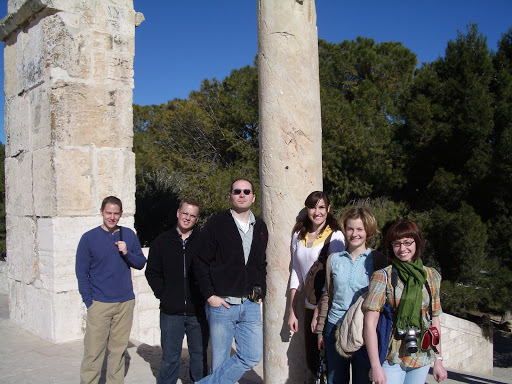 Corinthian columns built during Ottoman times (and BYU students). Wow Kimberly! There really aren’t many other words for it, just “wow”. It’s so awesome to see all of your pictures and read about your jerusalem adventures. I must say, i’m a tad jealous 😉 Hope you are having the time of your life there (judging by your blog and pictures, you definitely are!) I love you tons Kimberly 🙂 Ttyl for now. The picture of you in front of the Dome of the Rock is incredible. Glad you’re having fun! Miss you lots. Let’s plan our next adventure together! This is all so beautiful! i really wish I were there with you. it looks like such a pretty place. I can’t even believe it’s true! It almost makes me wonder if I’m seeing things! Are you really in such an amazing place as Israel? Waaaaay cool story and pictures.Are you reading anything while there? Alright, Kimberly, LOVED this… and now you are pushing the limit on how many days are allowed between posts here…. It sounds like you are having an amazing time. I think that it is so cool you are over there! I love reading your blogs; they are quite informative and entertaining. Love you and miss you!